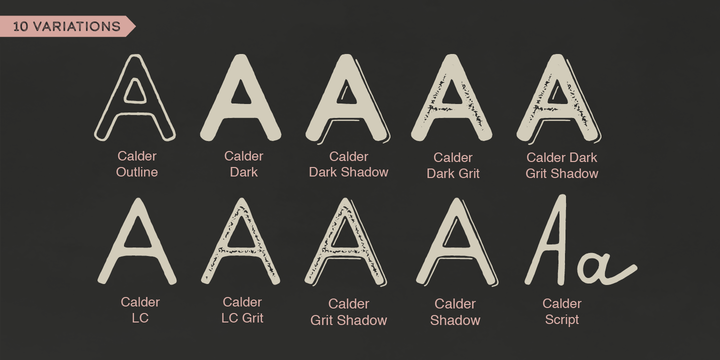 Calder is a display typeface family created by Mariya Pigoulevskaya and published by The Northern Block. Incorporating 10 styles in two main sets, a playful semi-connected script and authentic sans serifs, Calder features Uppercase and Lowercase, a personal unique look, rounded humanist corners and much more. Share the spirit of adventure with Calder! A font description published on Friday, September 9th, 2016 in Fonts, Mariya V. Pigoulevskaya, The Northern Block by Andrei that has 2,755 views.